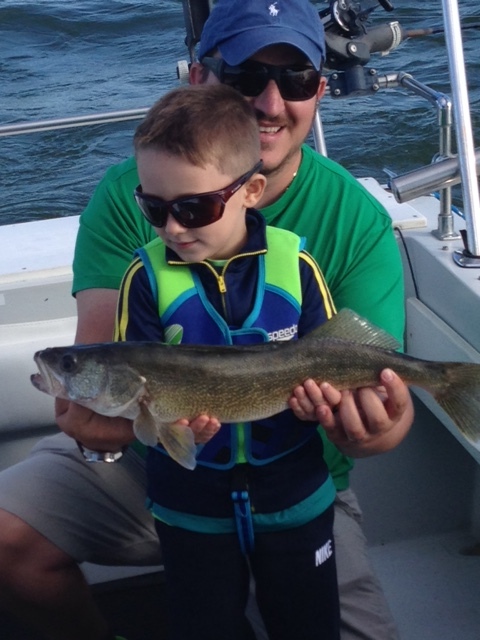 This past week the walleye bite really slowed down! There are some fish in and around the dump but the large school seemed to move out to deeper water. A captain friend found some out between McDonalds and West Sister Island but they have been hugging the bottom. We believe this has do to the weather we have experienced since Thursday. Blasted north east winds for 3 days! He’s been running 40 jets deep and dipsey divers, turned to 3, out 70 feet. 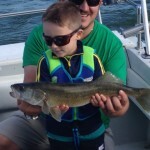 Start them off right with a Lake Erie walleye fishing trip!! I started my perch fishing trips Tuesday and have had great success with limit catches of perch between 8 and 9 inches with a few over 10 inches between the dump and McDonalds, on both sides of the line. Thursday it started blowing out of the North East and by noon the water was so muddy the fish just quit. Friday and Saturday the lake was still torn up and fishing sucked. Sunday the water started to clean up but the perch were not really in the mood. A couple of us captains jumped in the boat on a scouting mission. We left out of the Raisin River went north and east till we hit clean water past Sputnik. All we caught were white perch and silver bass. We worked our way back to McDonalds stopping 8 or 9 times to check for perch. We caught perch at every stop but never hit the mother load. Our best spot was around the #1 buoy off the Raisin River. We still caught lots of junk fish along with some keeper yellow perch. Purchase extra bait to make sure you don’t run short. W- buoy is a sure bet for perch and close to home. I’ve had some reliable reports from out in front of Luna Pier but have not fished the area yet, but I will this week. Don’t forget the Bolles Harbor public DNR launch will be closed until September 4th. They are repairing the road. Woot Woot!! !